On the flight over from France I watched the film “Sideways” on the little 6 inch screen. How did I miss this movie that won the Oscar for best film a few years ago? What a great movie! I mean there are buddy films and then there are BUDDY FILMS. This movie is buddy film at it's best. Now I know why Pinot Noir became so popular five years ago. I remember noticing this strange occurrence and now I realize why it happened. 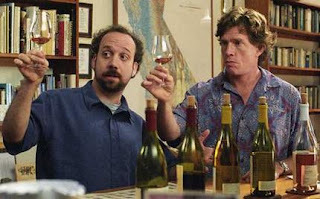 This may be old news to anyone reading this but because Miles (played by Paul Giamatti) arbors Merlot and worships the Pinot Noir grape, sales of Pinot skyrocketed and Merlot plummeted in the year following. It may be the most economically influential monologue ever delivered in a movie. There are so many reasons that I love this movie. The ensemble work is as good as it gets. You really get the feeling that not only do the actors love being a part of this movie, but underlying the entire thing is this feeling that they really love one another. I know that maybe that sounds nuts, but you just get the feeling that they all knew they were making something very special and that somehow transfers itself to the screen. 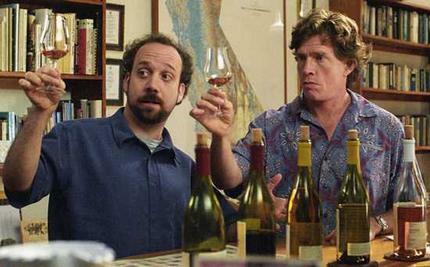 If you somehow missed this movie five years ago, treat yourself to a fine wine and rent this movie. I'm a little tired of the Right wing of this country calling the Democrats, "Socialists". It's just a way of making middle aged people remember the cold war and the Soviet Union. It's hateful and wrong, so here's what I think. First you must define what you mean by Socialism. Right now it's being used by the Right in this country as code for "communist". The fact of the matter is that all Western countries are socialist to varying degrees. The U.S. has socialist institutions: highways, military, utilities, fire departments, police, V.A. medical services, Social Security, and on and on. So, we are socialist to an extent. There are countries in Europe like France that have taken it somewhat further. France happens to have a more even distribution of wealth because of it. So, to say that there is anything inherently bad about socialism is to deny reality. It's mostly a matter of what you perceive to be fair. Many people in this country hold on to a sense of the American Dream which gives them the (mostly false) belief that if they work hard enough, and make the right decisions they could become as rich as Bill Gates. This attitude makes us uniquely "American". In France and England this sort of thing doesn't exist in the same way. People are more geared toward having a comfortable life rather than hoping for an extravagant one sometime in the future.